So many incredible parties were added to Catch My Party this week, including a stunning pink and gold safari themed wild one birthday party for a little girl. Get ready to be totally blown away! Wild One 1st birthday parties are such a popular theme for little boys. The book Where the Wild Things Are, tells the tale of Max's adventures in a place where the Wild Things are, is an absolute joy to read and is loved by so many children and adults alike. Shark Birthday Party and More! 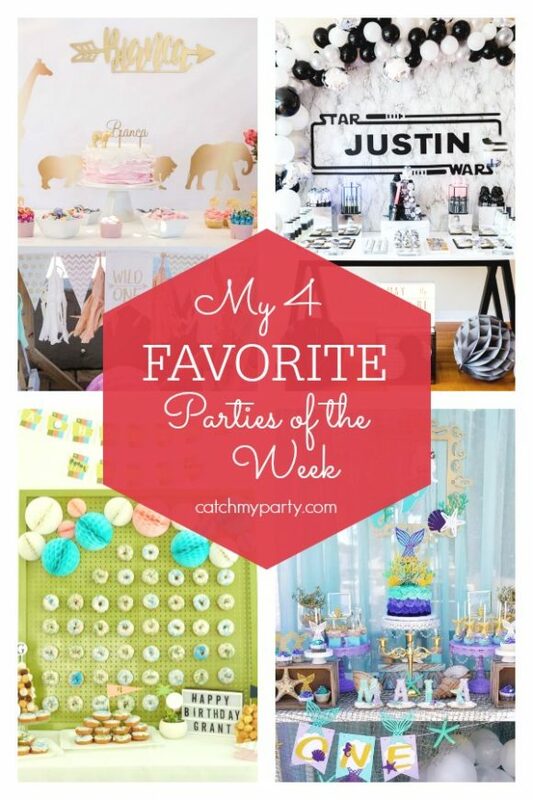 I can't wait to show you my four favorite parties added this week to Catch My Party! Trust me, you really don't want to miss the fun shark birthday party. It's made up of so many wonderful ideas and it great boy birthday theme for the summer! Modern Woodland Fox Birthday Party and More! So many fantastic parties were added to Catch My Party this week, including a wonderful Modern Woodland Fox birthday party! It's such a fantastic and unexpected take on the theme. Really spectacular! !